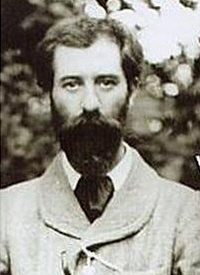 Charles Koechlin (pronounce:”Ke-klin” with “klin” to rhyme with French “vin”), (born Paris, November 27 1867; died Le Canadel, December 31 1950) was a French composer, teacher and writer on music. He wrote a very large amount of music, but very little of it was published because he was more interested in helping younger composers than making himself well-known. Some of his best works include his symphonic poems and his film music. Koechlin was born in Paris, the youngest child of a large and rich family. His mother’s family came from the Alsace near the French border with Germany, and he was proud of his Alsatian background. His grandfather on his mother’s side had started a cotton textile firm in Mulhouse and his father worked in the textile business. When Koechlin was 14 his father died. He showed an interest in music, but his family wanted him to be an artillery officer. However, he had tuberculosis and had to spent six months getting better in Algeria. After finishing his schooling he was allowed to enter the Paris Conservatoire in 1890. Two years later he was studying composition with Massenet, and in 1896 he was a pupil of Gabriel Fauré. Ravel was a pupil in the same class. Fauré had a big influence on Koechlin who wrote a book about him and helped him to arrange some of his music for orchestra. Koechlin became a freelance composer and teacher. He married Suzanne Pierrard in 1903 and they had five children. At first he was comfortably off, but after World War I the family lost a lot of money and they had to sell their country house. Koechlin had very free views about music, and this is probably why he never got a teaching job at the Piano Conservatoire. He also agreed with some things that the Communists thought. He did not like modern inventions like the telephone and radio. He looked like an old Russian patriarch with his long beard. He dressed in velvet trousers, sandals and a shepherd’s cape for bad weather. He liked outdoor activities such as swimming and mountaineering. He was offered the Legion d’honneur in 1940 but refused it. Koechlin composed in a variety of styles, even changing the style during a piece. He often liked quiet music with long chords which are played for the sounds they make rather than for giving the music a traditional shape. Sometimes there were no barlines in his music. He often composed in his head while on a train or climbing a mountain. His works for orchestra include Les Bandarlogs which was based on the Jungle Book by Rudyard Kipling. Kipling’s “Bandarlog” are a troupe of monkeys in the forest. The music describes the monkeys, but Koechlin also gives it another meaning: he is criticising music critics, comparing them to monkeys. In the Seven Stars Symphony each movement is about a famous film star. They include Greta Garbo, Marlene Dietrich and Charlie Chaplin. He wrote a lot of chamber music and piano music, including some dances for Ginger Rogers. This page was last changed on 15 September 2014, at 21:13.